Looking for a quality contractor to take care of a demolition project in Palm Coast, Florida? Every structure has a life span. Whether you've got an old outbuilding that has become unsafe, or are ready to begin a new remodeling project, Abel Construction Enterprises, LLC can help with your demolition. Kitchen and bathroom remodels increase quality of life and home values. While you’re sure to be satisfied by the end results of these updates, living through the chaos that is caused by the project can be a challenge to homeowners. Abel Construction Enterprises, LLC offers demolition services to kick of your project and speed up timelines for renovation. Our trusted Palm Coast demolition team quickly and safely tears down old fixtures and dispose of debris in preparation for remodeling. For quality demolition services, call Abel Construction Enterprises, LLC at (386) 269-4676 to schedule a consultation. Palm Coast demolition experts from Abel Construction Enterprises, LLC keep your projects on schedule. Why wait around for your work site to be cleared of unwanted sinks, countertops, and cabinetry, you can get started right away on that new room that you desire? Contracting companies that don’t have demolition expertise in-house take longer to complete projects due to the downtime, and extra labor needs and extended schedules. You can avoid holding up your renovation project by contacting us about our Palm Coast demolition services. Call (386) 269-4676 for a quick quote. Did You Know Demolition of Palm Coast Structures Is Regulated? 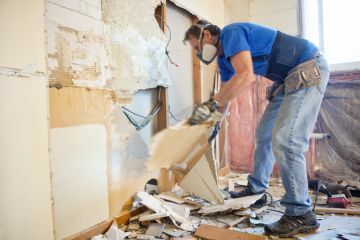 While the average three-year old regularly demonstrates above-average demolition skills, tearing down a permanent structure requires professional expertise and going through the proper channels. Some remodeling efforts involve handling hazardous materials or preserving natural land features, which is why you need to know when permits are required for Palm Coast demolition work. Abel Construction Enterprises, LLC has been guiding customers through the demolition permit and inspection processes since 1995. We make sure that your project starts and finishes smoothly. Sharp glass, broken tiles and splintered wood are common work site features during renovation projects. Without the proper training, tools, and safety equipment, you could easily incur injuries by doing the job yourself. We’ve been performing safe demolition services in Palm Coast for over 24 years. Our demo crew will arrive to your home with the right safety equipment to execute your project according to building codes and industry standards. Call us today at (386) 269-4676 to find out more about our demolition services.